If you're keen to savour a bite-sized sampler of America's Mother Road, Arizona's Route 66 is a bumper chunk of the highway, tightly packed with time-honoured attractions and Americana curios. 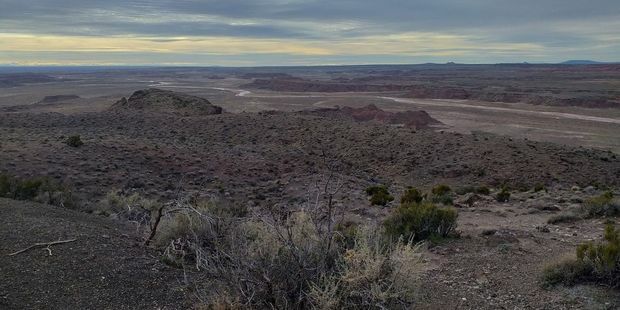 The natural terrain across Arizona is scenically blessed, as you cross stark badlands, cloud-swept plateaus and a desert painted in scandalous hues, safeguarding the vestiges of ancient civilisations. Heading east from California, or down from Las Vegas, once you've crossed the state line into Arizona, there's a swag of flavourful Route 66 towns and skeleton towns, either side of the turn-off to the Grand Canyon's South Rim on Interstate 40. Situated in the high grasslands of Northern Arizona, one of the first is Seligman, beckoning you with a sign declaring the town as the "Birthplace of Historic Route 66." Angel Delgadillo, the small-town barber is credited with leading the preservation movement that brought Route 66 back from the dead, after it was officially decommissioned in 1985. 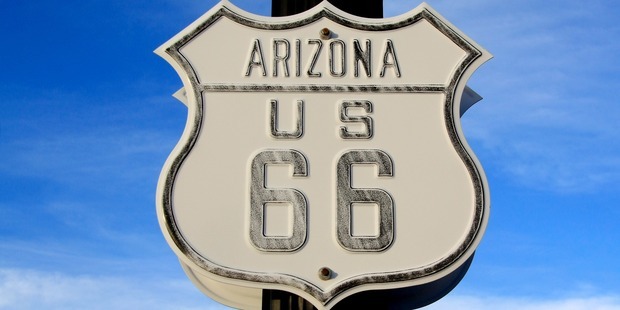 Arizona was the state that saved Route 66 as an historic landmark, spanning the belly of the United States. In 1987, Delgadillo and like-minded business owners successfully lobbied the state to designate Route 66 a historic highway, providing a blueprint that other states replicated. Angel and his barbershop are still in town. Delgadillo still holds court signing autographs and posing for selfies in his shop, which is now the Route 66 Visitor Centre. Grab a bite at Snow Cap Drive In, built by Angel's brother Juan in 1953, who was also actively involved in the preservation movement. Williams is a perennial favourite – and very familiar to travellers, as it is the gateway town into the Grand Canyon. It was also the last Route 66 town to be bypassed by the Interstate and the main street still marinates in glorious neon. Characterful saloons, restaurants and motels are all bathed in the liquid velvet neon glow. It's got the best souvenir shops, to boot. 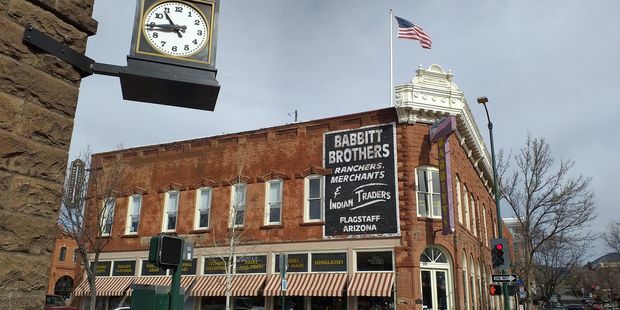 Further up the road, call into Flagstaff, a sturdy town with classical stone buildings, intermixed with retro Route 66 diners, motels and hotels. It's an infectious railroad town to explore on foot, taking in some of the old-school venues like the Downtowner Motel, which began life as a brothel. You'll also get your kicks in Winslow, immortalised in that classic Eagles anthem, Take It Easy. In the early 1970s, Jackson Browne wrote most of the song. When he got writer's block, he gave it to his neighbour, Glenn Frey, who finished it in fine style and his band made it a timeless hit that continues to resonate. "I'm standing on a corner in Winslow, Arizona. It's a girl my lord in a flat-bed Ford, slowing down to take a look at me." 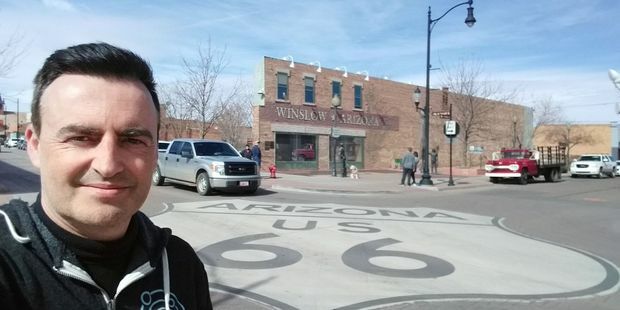 The town has milked it mercilessly, with millions converging every year to stand on a corner in Winslow, with all of the obligatory Route 66 livery emblazoned on the road. 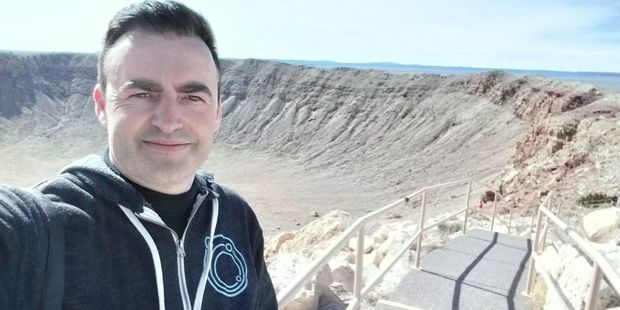 Mike Yardley at the Meteor Crater. Close to Winslow, don't miss the Meteor Crater site. Crashing to earth 50,000 years ago, at a speed of 26,000 miles an hour, the resulting carter is as deep as a 60-storey building and as wide as 20 rugby fields. Remnants of the iron-nickel meteorite, which probably broke off an asteroid, are on display at the site. But it's the sheer size of the crater which takes your breath away. This perfectly formed amphitheatre could play host to a wraparound crowd of 2 million spectators. It's considered the best-preserved meteor crater in the world, unravaged by the passage of time or nature's corrosive forces. Mike Yardley at a Najavo Trading Post. Initially it was believed to be an ancient volcanic crater, but geologists discovered it was caused by the impact of a meteorite, paving the way for more discoveries worldwide. Because of its lunar-like surface, NASA actually used it when training Apollo astronauts for missions to the moon. 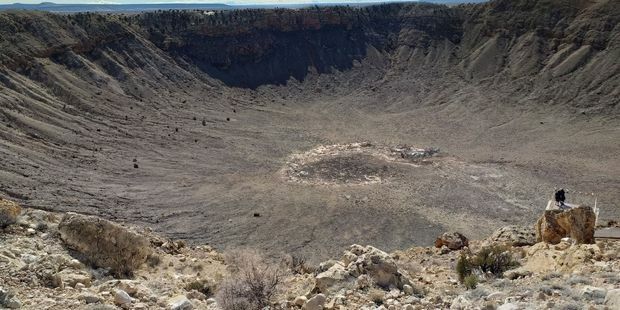 Even though it's considered a pipsqueak compared to the meteor crater that would have been formed in Mexico sixty million years, wiping out the dinosaurs, it's a gob-stopping sight. 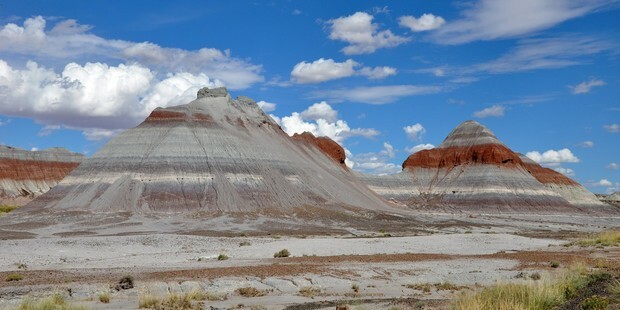 Follow the signposts to the Petrified Forest. This is the only national park that Route 66 actually runs through, and if you like things fossilised, this is a forest for you. The forest hadn't been to a horror show, its name very much reflects the fact that massive ancient forests were buried under volcanic ash millions of years ago, before uplift and erosion exposed this strange mash-up of sparkly quartz logs. Like precious gems shining in the sun, remnants of a prehistoric forest lie at your feet. Colourful specimens, from small shards to humungous trunks are strewn across these Badlands, including a massive log that forms a natural bridge. Over time, the logs soaked up groundwater and silica from the volcanic ash, crystallising into quartz. The mix of minerals has created the wondrous rainbow of colours threaded throughout the park. Another top draw are the ancient etchings of rock art. Newspaper Rock displays over 650 petroglyphs, carbon dated as over 2000 years old. An abandoned 1932 Studebaker evokes the heritage of the road. 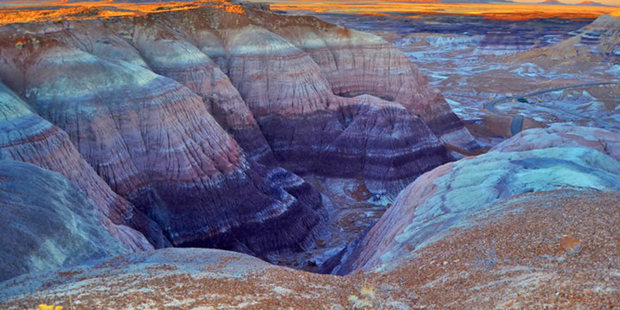 Also within the national park is the aptly named Painted Desert, spectacular badlands of multi-coloured rock, with bands of red, violet, green, and white sediments. Try and time a visit here at sunset, which takes it next-level. 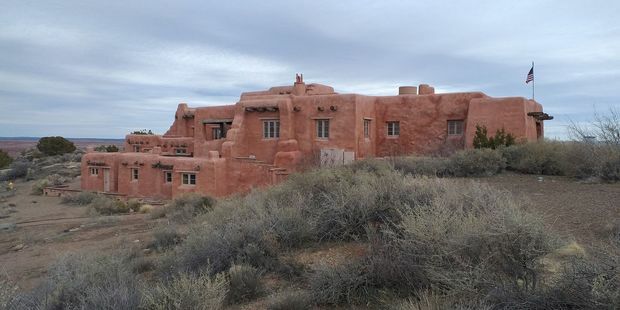 An absolute heart-stealer, adjacent to the sweeping lookouts across the desert palette, is the Painted Desert Inn. Built in 1920, this classic lodge was originally constructed in petrified wood before being renovated in Pueblo Revival style. Ponderosa Pine logs protrude from the adobe and stone walls, earth-toned stucco and flat roofs. It was renovated by Mary Jane Colter in 1947 and designated a National Historic Landmark, at the same time that Historic Route 66 was recognised. In its early days, many Router 66ers would stay a night in this princess-pretty lodge, but now it's preserved as a charming museum. 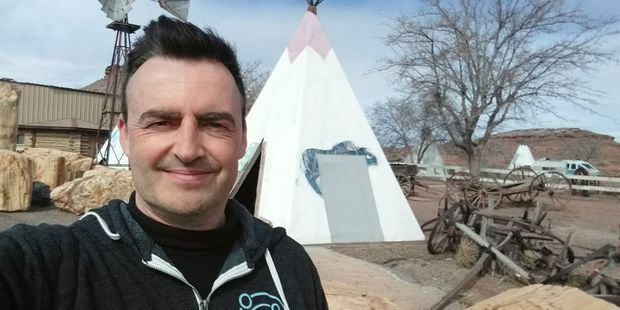 Speaking of accommodation, nearby Holbrook is home to the famous "Sleep in a Teepee" Wigwam Village Motel. Very kitschy, but a genuine Route 66 icon harking back to the 1950s. 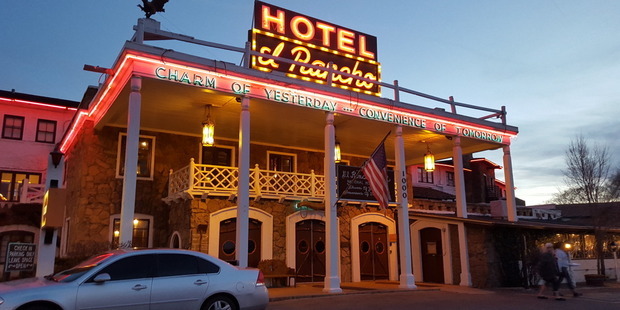 Across the state line, in New Mexico, I headed to Gallup to stay a night at El Rancho Hotel. Built in 1937 by the brother of movie magnate, D W Griffith, this rustic stone and wood multi-storey hotel fast became Hollywood's on-location accommodation headquarters, particularly for the cast and crew of Westerns. A constellation of film legends stayed here while shooting in the desert, including Ronald Reagan, Kirk Douglas, John Wayne and Katherine Hepburn. Every room is named in honour of a movie legend who was a regular guest. Signed photos of the stars adorn the magnificent two storey open lobby with its circular staircase, heavy beans, Navajo rugs and mounted trophy heads. Vintage eye-candy at every turn. Dive into the trading post scene either side of the state line with New Mexico. The area is responsible for 70 percent of the authentic Native American art sold internationally and home to Window Rock, the capital of the Navajo reservation. I popped by the Chief Yellowhorse Trading Post. This proud Navajo Indian ran the business from 1960 until his death 20 years ago, but is still managed by the Yellowhorse Family. The spirit of the old road sure lives on. I booked my stay at El Rancho Hotel through Expedia. Did you know on Expedia you can get discounted rates on a great range of hotels when you add on to your existing trip? It's called the Expedia Add-On Advantage. Book your flight, car or package on Expedia and you'll instantly unlock up to 49% off select hotels until the day of your trip. There are some superb value packages. I flew to Arizona with Hawaiian Airlines Hawaiian flies from Auckland to Phoenix via Honolulu. The full-service carrier operates onward from Honolulu to 13 U.S mainland destinations. Kiwis love the airline's Extra Comfort upgrade, which provides more legroom, priority boarding, a personal power outlet and amenity kit. Purchase Extra Comfort for just $139 NZD. It's very popular so book early to avoid disappointment! Flying Hawaiian Airlines to Honolulu and then connecting onward to the mainland means you can clear border security while channelling tropical island vibes.